Good: Great graphics, atmosphere and soundscape, good diversity in puzzles. The Inner Friend will immediately remind you of the 80s with the retro look and synthwave music of the title screen, and seems inspired by the TV series ‘Stranger Things’. As you play a bit and find some classic toys this impression will quickly be confirmed, and you know you’ll be exploring the nightmares of a kid who grew up in the 80s. The nightmares should be familiar to anybody: a school, the hairdresser, or a scary museum, for instance. Explore the nightmares and try to survive in this interesting horror game, developed and published by the indie game studio Playmind. The inner friend is about a boy experiencing childhood nightmares. Most of the story is being told through environmental context: first you’ll find yourself floating as an incorporeal being in a room, watching a sleeping elderly person. As you approach him and slip inside his head, you’ll eventually find yourself falling through an endless void, filled with strange, abstract cubes which remind a bit of apartments. As you manage to float near one and enter it, you’ll spend some time exploring, looking at blocks, until you discover a strange glowing surface. As you stand on it, you’ll be transported into a nightmare. These nightmares are classic children’s nightmares: nightmares about angry teachers at school, about the hairdresser, being locked into a strange museum, a scary hospital, things like that. You are never told what you need to do, you’ll just have to figure it out for yourself. But it’s not too hard to see what you need to do next, as you are walking around and exploring, and interactable objects are clearly marked so you won’t be too confused. Most of the time there’s only one way to go, usually just with a bit of creepy hindrance you’ll need to avoid or circumvent. The way the story is being told through the environment is well done: it makes you feel lost as a player, which really fits the theme of being locked in a nightmare. However, it would have been nice if the different stages you’ll play through would have a bit more context to them, so they don’t feel as much like random snippets. You’ll just find yourself in scary places, and after each stage you’ll be back in your bedroom where you’ll be starting a new stage. You don’t see any effect of the completion of the stages on the kid in the bedroom, or what the memories actually meant to him. The only thing which changes is the amount of furniture and toys in the room, and the position of the boy. Sadly, the ending is a bit abrupt and doesn’t give much context either. This game has beautiful graphics. The atmosphere is very gritty and dark, which fits the nightmare theme. All nightmare levels look damaged, old and decrepit, which fits the mood very well. The main character looks like a featureless shattered porcelain doll, with glowing holes moving on his body. This design is really creative to represent a child-like dreamer anyone can identify with, since he doesn’t have a face or other identifying features. You’ll often be following a glowing fog-like child, which seems to represent memories of the child. 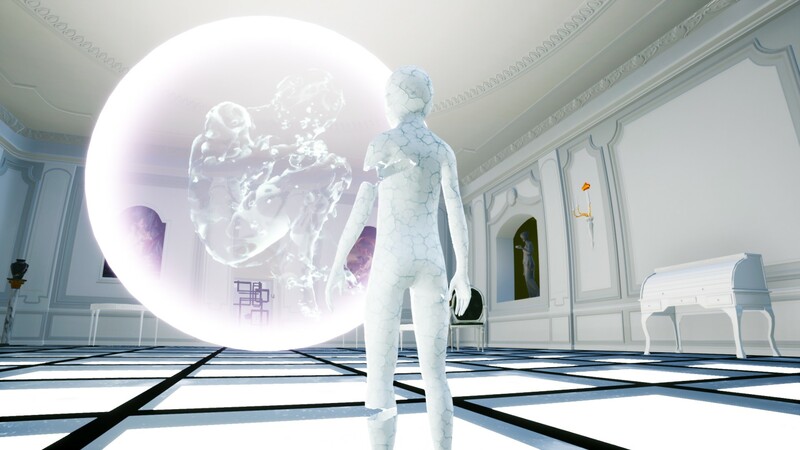 The graphics can get really surreal in some stages, with floating objects or bizarre things happening around you, and hallways that change as you turn your back. The atmosphere and design of the levels is really amazing! There is no UI visible on the screen, the only thing you’ll see is just a sign that you can click as soon as you come near an interactable object. The soundtrack is suspenseful but unobtrusive as you play, and seems to be inspired by the synthwave music style. The scary sounds of the monsters and the environment certainly do the trick: sometimes you’ll just hear monsters while being locked in a room, and it’ll certainly freak you out when it’s happening, and make you extra cautious when the door opens again. There is no narration at all; the story is exclusively being told through environmental context. 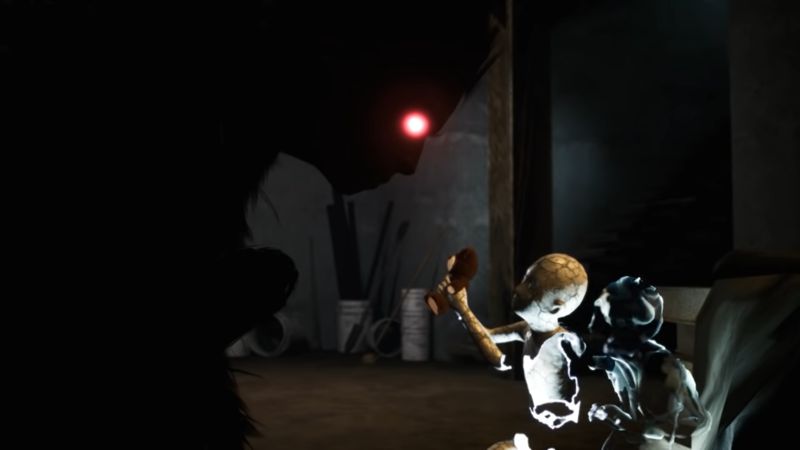 The Inner Friend is a puzzle adventure game with a horror theme. There are several stages you’ll play through. Each stage has a different theme, a different nightmare, with a different type of puzzle. At the first stage you’ll often encounter a little boy who seems to be in trouble, which in a sense gives hints about what you’ll need to do in that stage to progress further, or rather: what you’ll need to avoid. After you’ve finished the first stage you’ll be following a translucent child who seems to be the owner of these memories, and guides you through the levels. 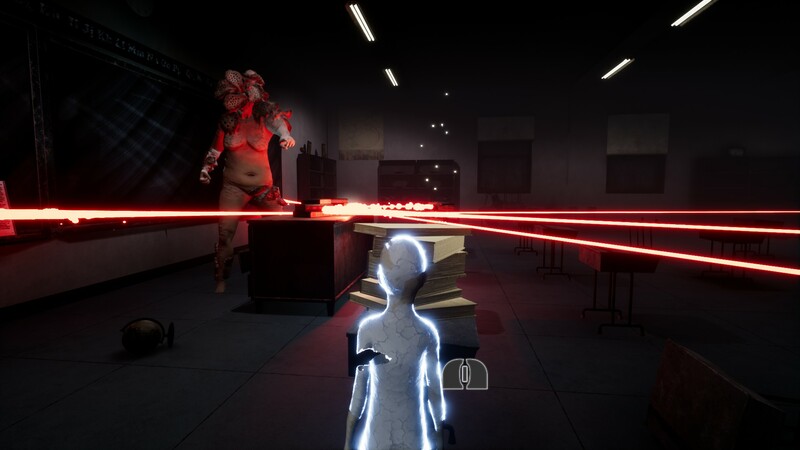 The game starts out rather vague, where you’ll just move around and try to figure out what you’ll need to do, until you’ll enter one of the actual nightmares. Each nightmare has a theme, and its own scary thing you’ll need to hide for or run from. It can be a monstrous teacher who’s angry at you, a scary hairdresser you’ll need to run from, a strange monster, or just things you’ll need to avoid like deadly laser-beams of anger, clouds of disease around sick people, cameras, or electricity. Each stage also has a different type of puzzle, and you’ll have to find out for yourself what you need to do. The puzzles are not that hard to figure out but still challenging, and they fit well within the theme of the nightmare they are in. You’ll need to block beams or run and hide, or jump from bed to bed in a hospital. The controls are a bit sluggish though, but it’s not too problematic since you don’t need to have perfect timing or aim to finish the puzzles. Whenever you make a mistake you’ll die, but the game will restore you back to just before where you made the mistake. You can collect toys as you explore, things like books, a globe, drawings, and typical toys from the 80s like an etch-a-sketch and later an Atari. Each toy you collect during a stage you’ll add to your room, which is the place where you start from at the very beginning, and where you’ll return after each chapter. The room gets filled up more and more each time you’ll finish a stage, with different kinds of toys and objects. You can place any collectibles you find among the other toys in the room, and you’ll see the outline of objects you still need to find in the game. As you explore a level, sometimes doors will close right behind you, making it impossible to go back and explore further at that moment, but the door will usually open again as soon as you finish the task in that room. If you have the feeling you are going into the direction where you’ll need to go to progress, you can better take a good look around to see if there’s anything worthwhile to explore first and see if you find any collectibles, because you might need to take a detour sometimes to get back after you’ve finished the puzzle. Collectible objects are accompanied by a twinkling sound you’ll hear as you come close, plus they are usually located in a bright spot, so they are not that hard to find when you know what you’ll be looking and listening for. The game is rather short: it’ll take about 2 hours to complete. It does offer a lot of diversity however, fun puzzles and a great atmosphere. The game really scares you from time to time, and the stages all look beautifully surrealistic. All in all, this game is very enjoyable. The Inner Friend is a great looking game with beautiful and scary environments, and a good soundtrack and creepy soundscape. 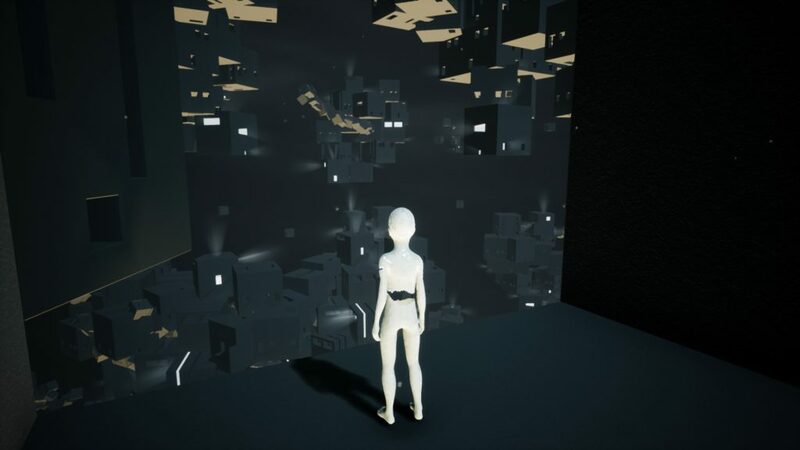 The concept of exploring a child’s nightmares is pretty cool, and how the levels are connected through a rather abstract world is really interesting. 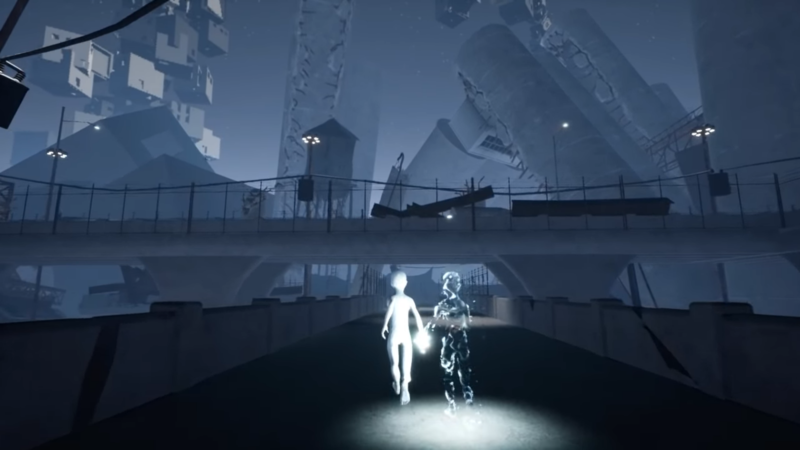 However, the story could use a bit more cohesion, as the stories feel a bit separate from each other, and the connection to the characters isn’treally clear: for instance, it would’ve been nice if you’d see the child growing up through the stages, or see something that connects to the memory of the place you are in. The fact that there are collectibles to find throughout the game is pretty cool, but it’s a pity they only seem to serve as decoration and don’t reward a bonus ending or anything.